Dental Office West Chester, PA │ Cosmetic Dentistry │ Denis A. Quagliariello, D.M.D. About the Office of Denis A. Quagliariello, D.M.D. At the dental office of Denis A. Quagliariello, D.M.D., our friendly, talented staff is dedicated to providing every patient with exceptional cosmetic and comprehensive dental services all under one roof. Our state-of-the-art technology and services are designed to help you feel at home, and our dental staff is trained to respond to the special concerns and needs of our patients. Whether you're missing a tooth, need dentures, a dental filling, or just a regular cleaning; we have the tools and knowledge necessary to help you. We work hard to provide a warm and welcoming environment for every patient. We take the time to discuss one-on-one with you about your dental options, and what would be best for your overall oral health. Your complete satisfaction with our work is our guarantee. A native of Delaware County, Dr. Quagliariello was raised in the Highland Park section of Upper Darby, Pennsylvania where he graduated from Monsignor Bonner High School in 1987. From there Dr. Quagliariello attended Villanova University receiving a Bachelor of Science degree in Comprehensive Sciences in addition to a minor degree in Biology. In 1995, he earned his Doctorate of Medical Dentistry degree from Temple University and received awards from the Endodontic, Stomatognathic, and Oral Surgery honor societies for showing dedication and excellence in those fields of dentistry. While at Temple University, Dr. Quagliariello became affectionately known as “Dr. Q” from patients, colleagues, faculty and staff. Upon graduation Dr. Q spent 12 years in a group practice in the Pilgrim Gardens section of Drexel Hill. Finally in 2007, Dr. Quagliariello transitioned into his own solo practice by opening a brand new state-of-the-art facility in Westtown, Chester County. Appearing in the Main Line Times as a Top Doc, as well as having a featured article in the Doctor of Dentistry magazine on redefining family-style dentistry are just some of Dr. Q‘s accomplishments. 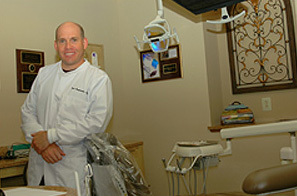 In 2008 and 2012 he was awarded one of “America’s Top Dentists” from the Consumer’s Research Council of America based in Washington, D.C.
Outside of dentistry, Dr. Quagliariello enjoys spending time with his family. He likes to travel and is an avid sports fan. He is active in the community as an assistant coach for his children’s little league baseball and soccer teams. He loves movies and music and has a special devotion to cars and racing, especially Scuderia Ferrari. “I am blessed to be in a profession to meet people everyday and from those meetings build enduring relationships. There is nothing more rewarding for me than to help people smile and feel good about themselves. Treating patients and having their trust is truly a privilege.” -Denis Quagliariello, D.M.D.